"When I talk to him, I feel like I'm outside." This is… a bit weird. I don't know what to make of this trailer. Is it terrible? Is it creative? Perhaps a bit of both? See for yourself. Warner Bros has unveiled a new trailer for the romantic drama titled Everything, Everything, adapted from the book of the same name. Amandla Stenberg, who played Rue in the original The Hunger Games (but is all grown up now), stars as Maddy in the film. The cast includes Nick Robinson as the boy she is in love with, Ana de la Reguera, Anika Noni Rose, and Taylor Hickson. The trailer tries to explain the story of this girl trapped inside her home (because she has a disease) entirely through emojis. I give WB points for actually creating this as a way to market this movie to younger generations, however, it totally irks to me to watch this. I can't believe this is how we kids communicate nowadays, but oh well. Get off my lawn! And if you're curious, give this a watch. You can also see the first official trailer for Everything, Everything here, with real footage from the movie. What if you couldn't touch anything in the outside world? Never breathe in the fresh air, feel the sun warm your face… or kiss the boy next door? 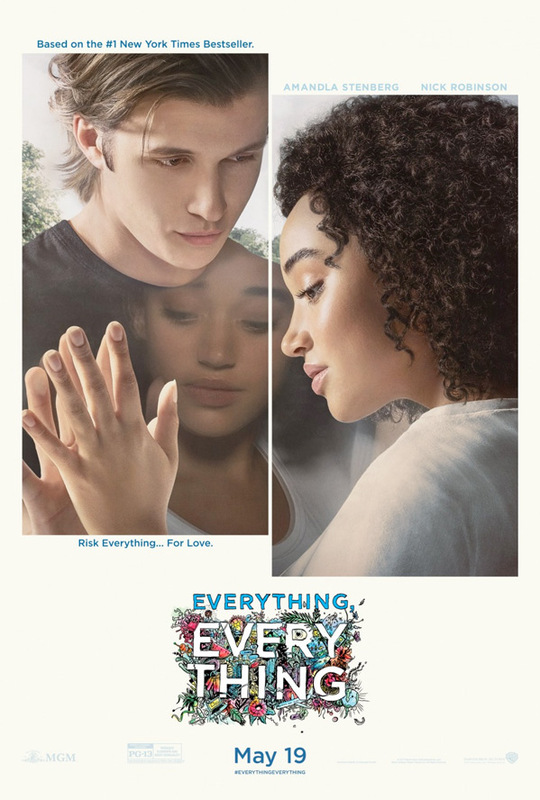 Everything, Everything tells the unlikely love story of Maddy (Amandla Stenberg), a smart, curious and imaginative 18-year-old who due to an illness cannot leave the protection of the hermetically sealed environment within her house, and Olly, the boy next door who won’t let that stop them. Maddy is desperate to experience the much more stimulating outside world, and the promise of her first romance. Gazing through windows and talking only through texts, she and Olly form a deep bond that leads them to risk everything to be together… even if it means losing everything. Everything, Everything is directed by filmmaker Stella Meghie, of the film Jean of the Joneses previously. The screenplay is written by Stella Meghie and J. Mills Goodloe, adapted from Nicola Yoon's book of the same name. Warner Bros will release Everything, Everything in theaters starting May 19th this summer.